Solution dyed nylon carpet comes in a wide range of designs, patterns, colors and constructions like loop pile , cut pile and cut & loop pile. Solution dyed nylon carpets are one of the most durable for commercial and residential use. 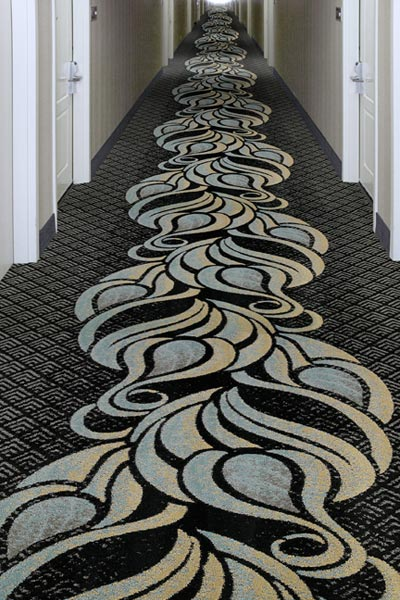 It is the perfect choice for busy offices, hotels, condominium hallways and any other high traffic area that requires a resistant carpet. Solution dyed nylon has the color as part of the fiber like a carrot as analogy even if you pour bleach on it, very little damage will be caused. Americarpet recommends solution dyed nylon to our most demanding customers requiring a durable carpet in high traffic areas. This fiber is also easier to clean than olefin or print nylon. Solution dyed nylon carpets have a thicker and softer touch which maintain a new appearance for a much longer than your basic nylon and olefin carpet. It is also stain resistant and fade resistant against sunlight.